Pretty soon all the other bats smelt the blood and began hassling him about where he got it. He told them to shut up and let him get some sleep, but they persisted until he finally gave in. OK, follow me, he said and flew out of the cave with hundreds of bats behind him. Down through a valley they went, across a river and into a huge forest of trees. 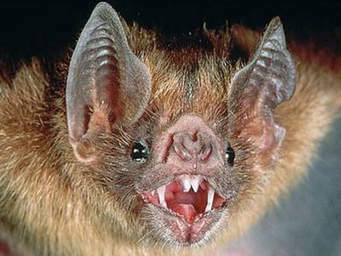 Finally he slowed down and all the other bats excitedly milled around him tongues hanging out for blood. "YES, YES, YES!!!!" the bats all screamed in a frenzy. "Good!" said the first bat, "Because I didn't"